When it's winter and co-o-o-o-ld, the last thing you want is for your heating system to fail. Electric-powered baseboard and wall heaters are normally extremely efficient, converting nearly 100 percent of their energy to heat and warming only the parts of your house that you choose. Still, as with any household appliance, you'll encounter occasional problems. If your baseboard electric heater is not working, there's a natural tendency to assume that an electrical issue is at fault. However, though this is the commonest reason, it's not always the case. Be an informed homeowner. Read our baseboard heater troubleshooting guide to learn the difference between a minor bug that needs only a simple DIY fix and one that requires professional HVAC repair. Baseboard Heater Troubleshooting Tip #1: make sure the power is on. Next, verify that the thermostat is set higher than the current temperature in the room. After that, check to see whether a ground-fault interrupter (GFI) or circuit breaker has tripped or a fuse has blown. Otherwise, the trouble may be a short in the thermostat wiring. If none of the above is at fault, there's most likely a problem with the heater itself, such as a burnt-out heating element, that will need repair by an expert. The heat flow may simply be physically blocked, which is easy to take care of. Make sure there's room for warmed air to circulate and the unit is not obstructed by furniture or heavy curtains. Allow 12" of clearance minimum, both in front of and above the heater, as well as at least 3/4" below. Do not place any object on top of the unit. This is imperative not only for the proper functioning of your heater, but also as a fire safety measure. Another possibility is that the heater does not have a high enough wattage for the size of your room. Per square foot of space, 5-8 watts for a baseboard heater or 10 watts for a wall heater is recommended in a modern, energy-efficient home --and more in an older house. Check whether the room itself is insulated well enough to prevent heat loss. Finally, be sure to heat all the rooms of your home at least minimally, even if some are unused. Cold air can seep into the room where you are operating your heater, lowering the ambient temperature. 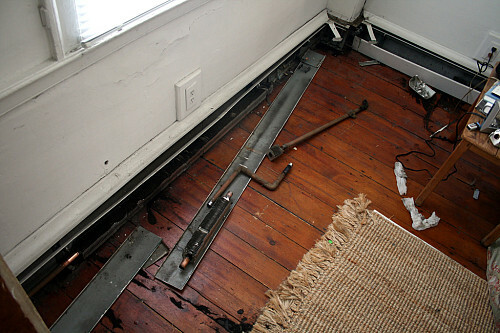 In general, electric baseboard heaters are a safe method of heating. There is no open flame or carbon monoxide emission to worry about. Still, they do require regular maintenance to prevent one hazard -- dust in the system. Dirt and hair can clog the heater's interior, especially if you live in a very dusty area or have a pet that sheds. This debris might even ignite. To clean your electric baseboard heater: Disconnect the electric power and allow the unit to cool down. Then use a vacuum cleaner equipped with a crevice tool to get all the dust out of the baseboard heater, working gently and carefully to avoid damage. For more information on maintenance of your electric baseboard or wall heater, read the manufacturer's instructions. Turn off the power supply to the heater immediately and call a reliable HVAC technician. Your unit is overheating dangerously, probably due to an issue with its wiring or damage to one of the components.